I couldn’t find the words to thank him! What do librarians hang over their babies’ cribs? Did you read the dachshund’s biography? Last Tuesday, January 23, National Reading Day was celebrated in the U.S. Later this week, on February 2, we mark World Read Aloud Day. On March 2, National Read Across America Day will be held (because March 2 is the school day closest to the birthday of Dr. Seuss!). And each September 6, National Read a Book Day is held. (August 9 is dedicated to National Book Lovers Day!) Why the focus on books, and do they still matter in today's digital age? According to the experts, they most certainly do! A Febuary 2017 article in The Washington Post states that reading with children is one of the most important things a parent can do. "Study after study shows that early reading with children helps them learn to speak, interact, bond with others and read early themselves, and reading with kids who already know how to read helps them feel close to caretakers, understand the world around them, and be empathetic citizens of the world," said journalist Amy Joyce. Empathetic citizens of the world ... boy, don't we need more of those! While we all know and can easily understand the intellectual benefits of reading, not everyone knows about the important bond it creates between adults and children, the creativity it fosters, and the empathy for others it instills. 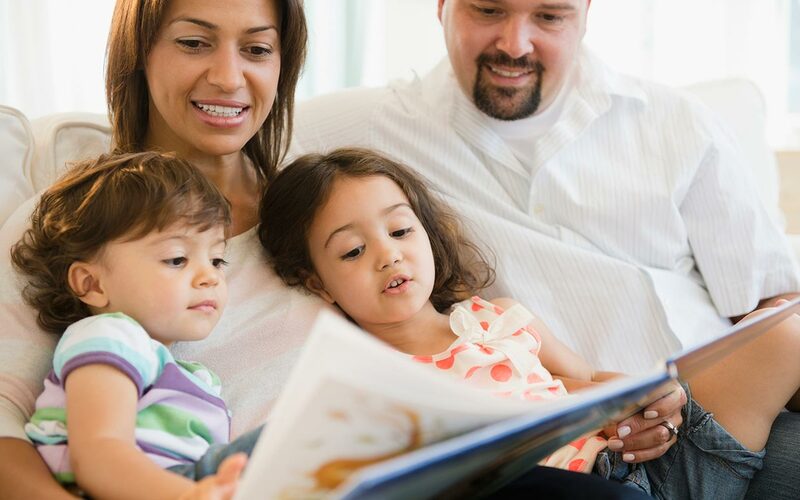 The WP article quotes Liza Baker, executive editorial director at Scholastic, as saying, "Even kids in older demographics love nothing more than [reading] time with their parents. We're blown away that kids time and again said the most special time they recall spending with a parent is reading together." The website Bilingual Kidspot lists other benefits as well, such as how reading enhances a child's concentration. And in today's frenetic, multi-tasking world, enhancing focus and concentration are important skills that help our children become better listeners, learners and doers. So when should families begin regular reading with their kids? Experts suggest that parents begin to read aloud to their infants and to keep reading to their children, even when they begin to read themselves. The lyrical nature of language and the sound of a parent's voice combine to stimulate children's brain activity and to reassure them at the same time, and research shows that the first few years of a child's experience irreversibly affects how their brains develop. While older children enjoy choosing books (sometimes the same ones over and over again! ), it's recommended that parents help younger children find books they will enjoy. Many parents leave it up to even young kids to choose something of interest; however, very young children often aren't sophisticated enough to realize what may be the appropriate reading level or what might hold their interest. Repeated bad experiences with books--where children struggle or get bored--can dampen their future desire to read. For young children, the WP article says parents recommend such books as The Cat in the Hat, Green Eggs and Ham, Good Night Moon and The Very Hungry Caterpillar. Parents with children up to age 17 recommend books in the Harry Potter series as well as Diary of a Wimpy Kid, The Magic Tree House and The Chronicles of Narnia. Books that feature diverse story lines and characters can help children better understand and appreciate diversity and inclusion, while also educating them about various cultures, religions, traditions and regions. And research shows that kids of all ages want books that make them laugh. In addition to the national observances that pay homage to reading, there are various organizations that support it as well. Started in 1989 at Boston City Hospital in Boston, Massachusetts, the nonprofit Reach Out and Read believes that "ALL families should have the tools and information needed to make reading aloud a daily routine and that ALL children should be given a foundation for success at school and beyond." Another group, Imagination Library, is one our Mountain State E-Club has agreed to support. Founded by Dolly Parton in 1995 for children in her native Tennessee, today the organization reaches children and families in not only the U.S., but also in Australia, Canada and the United Kingdom. "You can never get enough books into the hands of enough children," the organization quotes her as saying. "When I was growing up in the hills of East Tennessee, I knew my dreams would come true.... The seeds of these dreams are often found in books, and the seeds you help plant in your community can grow across the world," Parton says. "Why we should all be reading aloud to children." Thank you for participating in this week's meeting and for the difference you make in others' lives each day. Please leave a comment to let us know of your meeting "attendance."